OUR POLICY: Quality is Paramount no matter how large or small your project. BMW Precision Machining makes the commitment to first understand our customers’ requirements; then, to meet or exceed our commitment to those requirements by performing the correct tasks, defect-free, on time, every time . We are committed to continually improving the effectiveness of our Quality Management System and complying with the requirements of ISO 9001:2015. 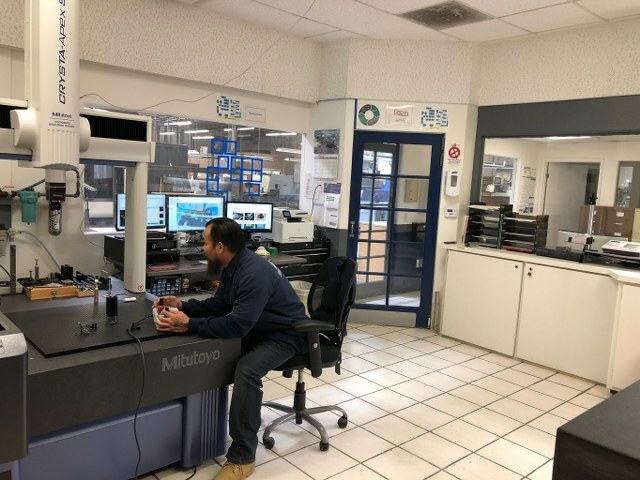 Our QA inspectors work with Coordinate Measuring Machines, Surface Plates, and GageMaster Shadowgraph Comparators as well as gages traceable to the National Bureau of Standards. Statistical process control is standard on every job in all affected axis. Visual inspection is also a critical step in the process to ensure burr-free parts. We control and track each job using computer-generated manufacturing lot numbers with bar codes, for better traceability. Ongoing training of our talented QA team and upgrading of QA equipment helps preserve our rigorous standards and outstanding acceptance rate. If you’ve got a project that demands superior quality, quick turnaround and exceptional service, contact us today. Hand and high volume assembly. Whether you need a single R&D prototype or thousands of parts, B.M.W precision’s cost effective turnkey services include material and hardware procurement. Some of our inspection equipment include: Brown & Sharpe MicroXcel 765 DCC CMM (shown to your above), Series Twenty Gage Master Scope, Starrett Model 2000-24 Height Gage, Model HG-12 Cadillac Gage, Micro vertex 500-750 Height Gage, Grade “B” Granite Plates with Dial Indicators, Nikon Microscopes, Master Gage Block Sets, Set Bore Gages, Master Set Pin Gages, MicroVu Model 500HP, Mitutoyo Height Gages, Etalon Height Gage. Copyright © BMW Precision Machining, Inc. All rights reserved.